Magatte Wade was born in the West African nation of Senegal, was educated in Germany and France, then came to the U.S. She is a frequent speaker at business conferences and college campuses, including Harvard, Yale, Columbia, Cornell, Brown, Dartmouth, MIT, and Wharton. 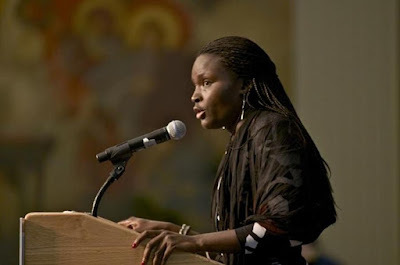 She has started businesses and with her husband is working to create schools in Senegal. Part of one of her addresses featured on YouTube dealt with how not to be poor. What she said to her audience is a good lesson for everyone. This is not a bolt from the blue to most of us, but to her audiences in colleges and in her native Senegal, this solution may not be so obvious. In fact, some of her audiences responded that jobs actually come from government. Yes, she responded, some jobs are provided by government. But where does government get the money to pay its employees? If jobs are the answer, and jobs come from entrepreneurs, businesses, “then don't you think that we should really try and pay attention to what type of environment those businesses get to operate in,” Wade asked? What a concept! Since businesses large and small provide the jobs people need to avoid poverty, and enable workers to pay taxes, and pay taxes themselves to support the government, let’s be careful about the environment that we create for businesses. Far too often, this is not easy, and sometimes impossible. To put the regulatory issue into perspective, the Federal Register is where federal rules are catalogued. The number of pages in it was about 2,600 in 1936. That’s a lot of pages of rules, but it pales in comparison to the calendar year of 2016, when the number of Federal Register pages stood at 95,854. Certain variables factor into this: Some rules take more pages than others, and page size is also important. However, most novels have 250 words per page, and a really long novel has 425 pages. At the end of 2016, the Federal Register had as many pages as 225 long novels, and 383 normal-sized ones. President Donald Trump has implemented efforts to reduce regulations by signing an executive order on Jan. 31, 2017 for the agency requesting a new regulation to cut two older regulations. That’s a start, but a lot more needs to be done to give Americans the freedom and ability to start a business or get a job. She’s right, of course, but things like over-regulation make that much more difficult for even those who are determined to succeed.